Capturing beauty. 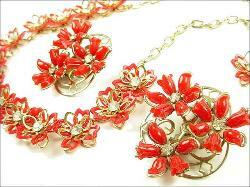 Designer signed Necklace Parures, Coro's, Antique Necklace Parure's, and many more to select from. floral endings. 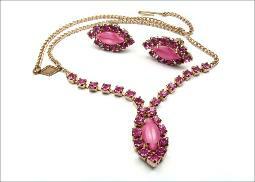 Complimentary earrings - they go oh-so-well with the necklace. 1 5/8" across. 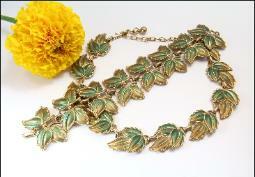 Green and gold colored leaves, set is marked with three circles on the back of the bracelet leaf (designer unknown). 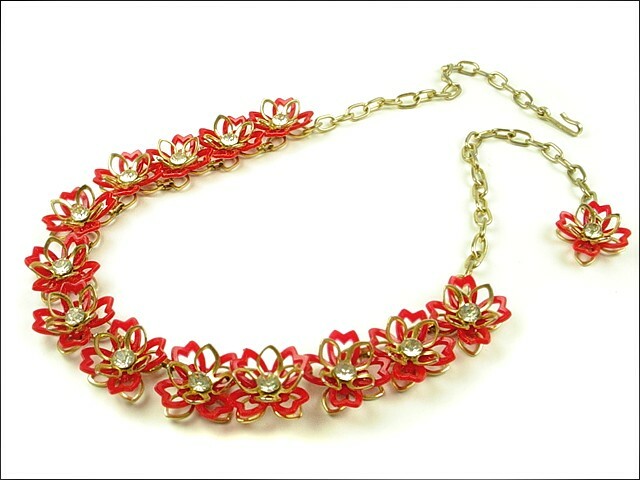 Necklace - 16 1/2" length includes the hook clasp. 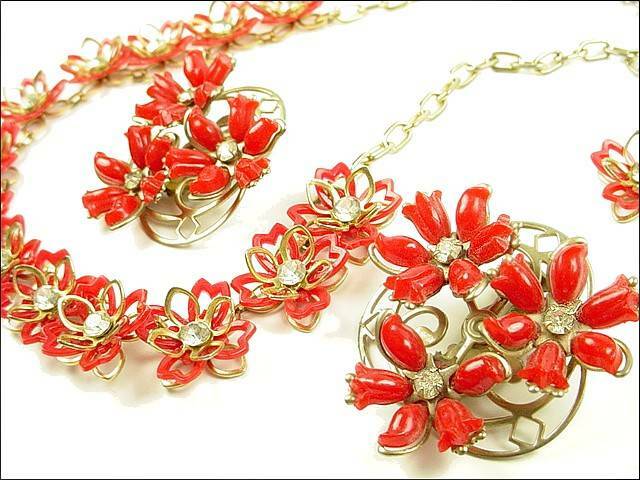 Vintage wide bracelet - 7 1/4"L x 1 1/2"W.
closure. Earrings - 1 1/8" x 3/4", these clips are the screw-clips (to loosen or tighten the clip pressure). prong setting. 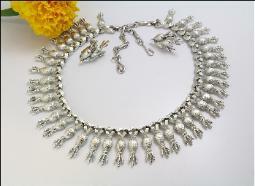 Necklace - 15 1/2" long including the j-hook closure, front drops are 3/8"+. Earrings - clips, 1" wide, chatons rs in a drop step design. Vintage necklace set. hook closure. Earrings - circular clips, 1" in diameter. and finial. 15 1/2" long not including the length for the clasp. 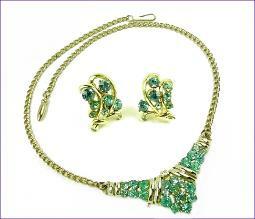 Coordinating earrings - screw backs in golden detail. 1/2" not including the length of the J clasp. 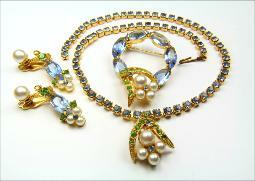 Brooch - 2”L x 1 1/2"W. Earrings - clips, 1 1/2"L. c. 1960. 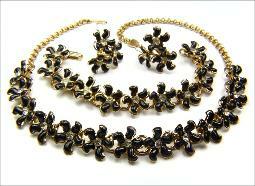 3-piece set, dimension with ornate flowers rhinestone centers with five black petals. 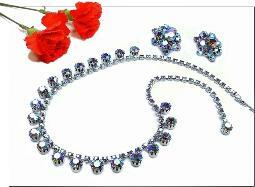 over clasp. Earrings - screw backs, group of 3 flowers, 1". length, J hook clasp. Earrings - clips, 1 1/4". We own such busy lives and the few minutes we have left in the day to focus on ourselves is truly essential. View our necklaces, imagine them at your neckline, pick out something for yourself. 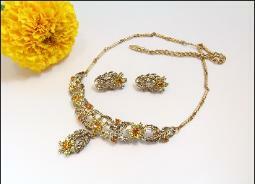 So many pieces of jewelry, embellished with the sweetness of beauty. 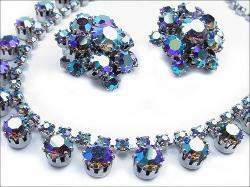 Wear them, look stunning, and feel fabulous!"